Dr. Armin Stein and PD. Dr. Daniel Beverungen spend a research visit at UNIST, from July 24th to August 6th 2014. Armin is the Managing Director of the ERCIS research network and will foster our programs of researcher and student mobility in the ERCIS network. 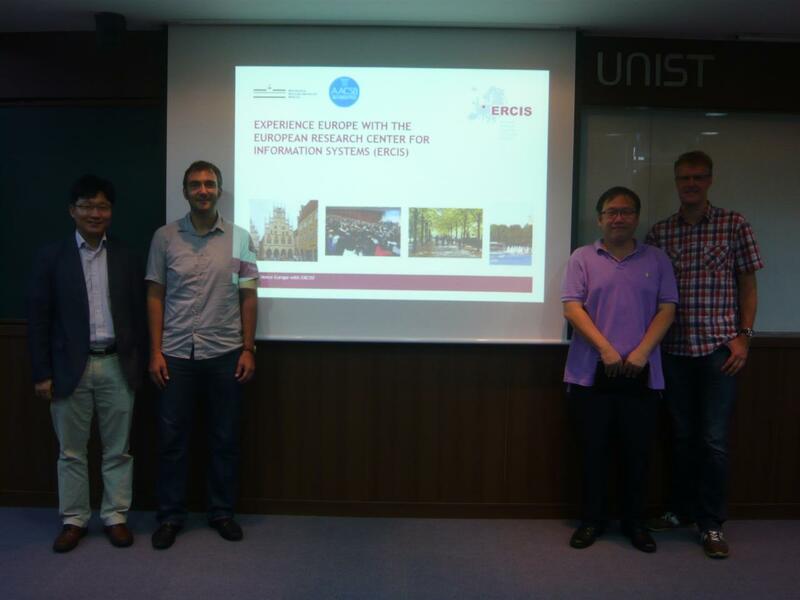 Amongst others, current initiatives for joint teaching with cooperation with UNIST include the ERCIS virtual seminar, in which students from many of the institutions affiliated with ERCIS cooperatively develop a research paper on current challanges of the IS field, and the student exchange program between WWU and ERCIS that has been successful to draw students from either side to spend a semester abroad. Daniel fosters the joint research initiatives of WWU and UNIST that currently focus on business process mining in service industries. Another objective of the research visit is to network with the professors and senior researchers at UNIST in order to identify potential research areas to pave the ground for joint research and joint industry projects.